How and where is Eucapil® approved? Eucapil® is approved as a cosmetic hair care agent for topical use in the Czech and Slovak Republics and can therefore be employed as such in all other EU countries. How soon can we expect the release of Eucapil® in France and other European countries? The substance fluridil has been registered via France in the EU, and approval of Eucapil® as a cosmetic hair-care agent has been granted in the Czech and Slovak Republics. Eucapil® can therefore be utilized in other EU countries. Several other countries have also approved the product as a cosmetic agent. Is Eucapil® approved in the U.S., Japan or Canada? Eucapil® is not yet approved for sale in these countries. Depending on the particular regulations , cosmetics can be brought in by travelers or imported for personal use. Please consult your customs agency. Will Eucapil® be effective if applied to the hair? 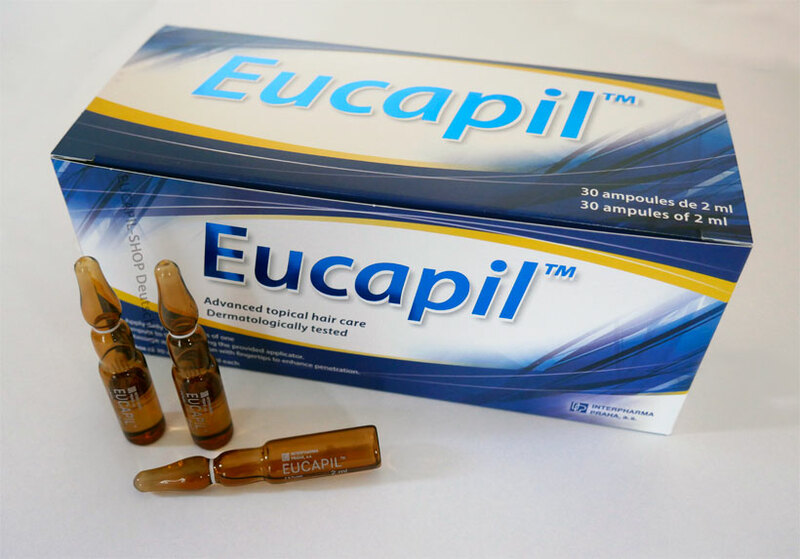 Eucapil® was designed to be applied directly to the scalp in order to enter the hair follicles thus affecting the hair loss and promoting strengthening of the hair stem. Application of Eucapil® to the hair only would thus not be effective. Will Eucapil® affect hair on other regions of the body? 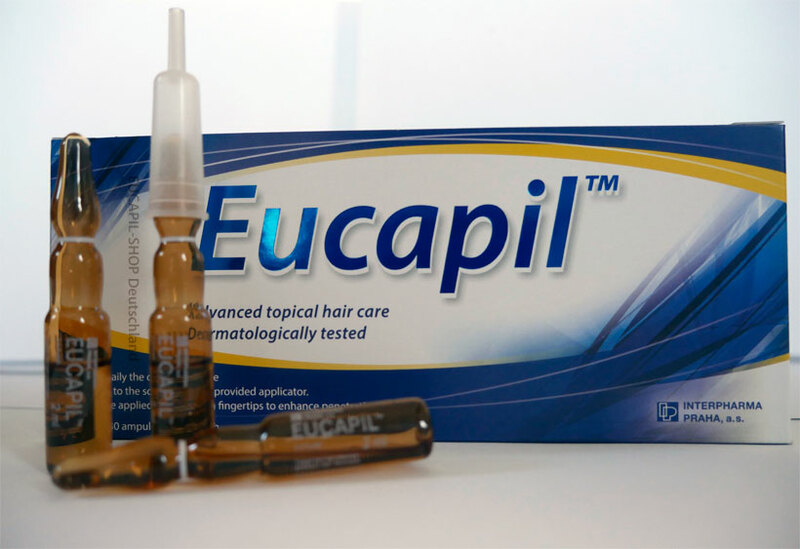 Eucapil® applied to the scalp skin will promote hair growth only in that region. 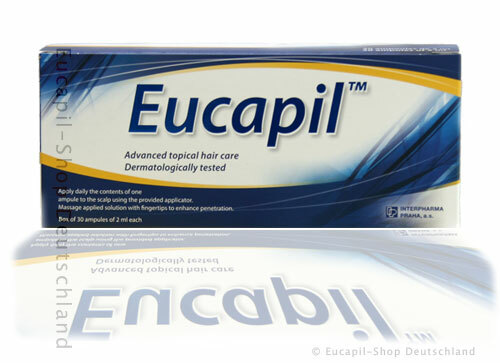 Effect of Eucapil® formulated as gel has been studied in facial hirsutism (excessive growth of hair in women) where the male hormone promotes hair growth (in contradistinction to the scalp). Will Eucapil® affect the body systemically? 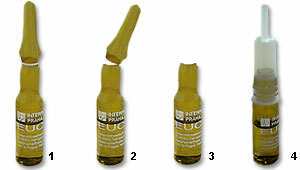 Daily application of Eucapil® has not affected the normal levels of testosterone in the body. This was demonstrated in a 12-month clinical trial in young males. (see the articles). What will happen if Eucapil® gets into my eyes? If Eucapil® runs into the eyes during application, the eyes should be immediately flushed with copious amounts of water. The studies indicate that Eucapil® has a low irritation potential and any ocular irritancy observed in safety studies proved to be completely reversible. As noted in our package insert, we recommend applying Eucapil® with the head tilted back to facilitate its distribution and to prevent exposure to the eyes. Is the isopropyl alcohol formulation of Eucapil® safe? Isopropyl alcohol, also known by its common name rubbing alcohol, is used in many cosmetic products, is listed in the Pharmacopeias as a useful topical vehicle which has low hazard potential to human health. When is the best time to apply Eucapil® ? Although it is recommended that Eucapil® be applied at bedtime, it can be used any time, provided that the scalp is dry. Will shampoo affect Eucapil® ? No, but for maximum effectiveness Eucapil® should not be washed away soon after the application. It can be applied after shampooing, making certain first that the scalp is completely dry. What about Eucapil® and sun exposure? While using Eucapil®, it is not recommended to expose the scalp to strong sun: sunburn, the scalp inflammatory reaction, might be potentiated. Can Eucapil® be used with other topical hair loss treatments? We hear that some customers are using Eucapil® concurrently with other hair loss treatments. The effectiveness or safety of Eucapil® in combinations has not yet been studied. Eucapil® may not be applied simultaneously with water based products. Can women use Eucapil® ? Eucapil® is safe for treatment of hair loss in women. As a precaution it should not be used by women who are pregnant, breast-feeding or planning to become pregnant. What side effects can I expect from Eucapil® ? To this day, no side effects have been observed from daily topical use of Eucapil® when used as described in the product insert. Patients with a propensity toward seborrheic dermatitis (scalp irritation) may experience a flare-up of their condition attributable to the topical rubbing alcohol component of Eucapil® . These events proved reversible upon cessation of use. How long must I use Eucapil® ? 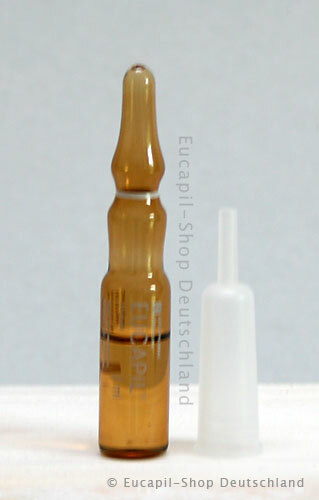 Eucapil® should be used daily, as long as necessary. We cannot predict individual responsiveness. Can I use Eucapil® twice daily? The current studies indicate that once a day application of Eucapi® is sufficient. Can Eucapil® be used with all colors and types of hair? Yes, but we have occasionally seen that white hair can acquire a light yellowish hue which nevertheless can readily be washed away. Is Eucapil® still effective if people shampoo their hair daily? Is it absolutely necessary that the user shampoos no more than once or twice a week? First, one would generally assume that applying anything on the scalp and then washing it right away would probably be counter-productive. Second, Eucapil® was designed to degrade in the water environment. 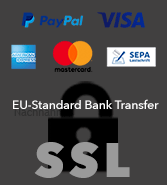 This is a security feature. Eucapil® is resorbed into the skin only, there is no evidence for systemic resorption and any side-effects:. Eucapil® was designed to decompose should it for whatever reason enter the body, (such as accidental ingestion). Therefore, it is important not to apply fluridil to the scalp when wet. Third, shampoos remove the skin and hair fat effectively and thus signal to the sebaceous glands to work harder: a vicious circle is thus established. We hear from Eucapi® users who have reduced their shampooing frequency, washed hair with warm water and some soap only, or used the so-called “dry shampoos” that although it took many weeks before the scalp glands’ activity returned to normal, it eventually did. What is the topical/local half-life before Eucapil® is absorbed/distributed into the circulation? Eucapil® is designed not to be resorbed systemically and to act only topically on the scalp skin. Not even traces of fluridil ( measured at the extremely low level of 5 nanograms /ml) or its decomposition products were found in the blood or urine of the subjects who used the product over an extended period of time. Fluridil is also designed to degrade in an aqueous environment, such as if accidentally swallowed. The topical half-life (on the skin) cannot be determined as it depends on the individual humidity and overall condition of the skin. How would you compare the effectiveness of Eucapil® to that of finasteride, dutasteride and minoxidil, respectively? Eucapil® has not yet been tested in a comparative study with the above media. The data in the Drug Development Research can be compared to the published data for these and other products. Interpharma Praha, a.s., the manufacturer of fluridil and Eucapil® and Biophysica, Inc., the holder of patent rights to fluridil, are not responsible for the correctness, completeness, reliability or usefulness of the information provided below. Viewing these questions does not constitute a consultation or the rendering of advice. While there may be information below related to certain medical conditions and their treatment, should a medical condition exist, promptly see your own physician or health care provider. Please consult the labeling of this cosmetic product before using it.